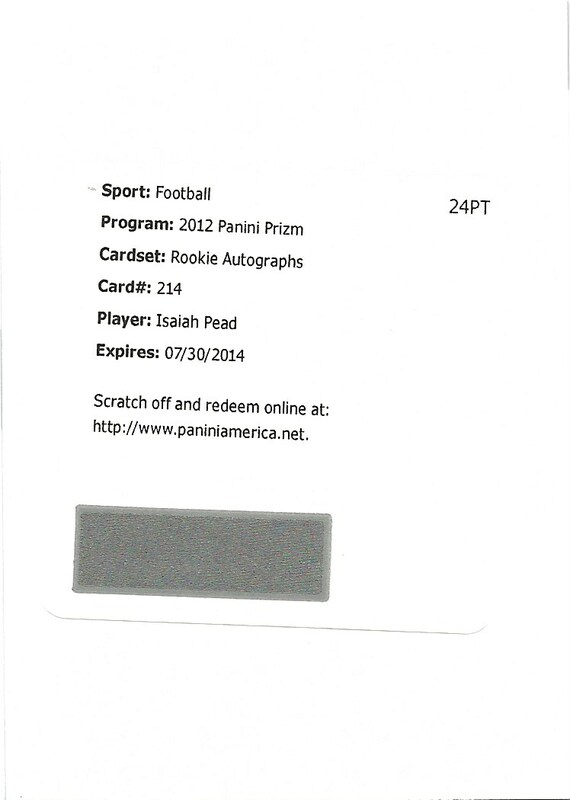 On June 17th of 2012 i purchased a box of Panini Rookie Signatures from my local card shop, The Sports Room. When i opened the box in front of Rick he quickly noticed my disappointment in the cards i pulled, and of course the freakin 80pt white card with a scratch off code. I pulled a redemption card, which meant I didn’t get my full hit on the small box of cards i purchased. Not to mention it was of Dre Kirkpatrick, the Bengals (then) rookie cornerback. 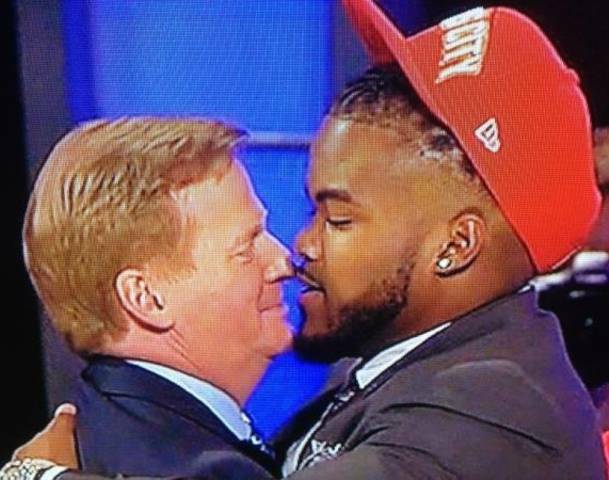 Nothing against Dre, i’m sure he’s a wonderful kid with a great family and loving parents but i’m not super excited about a Bengals CB. 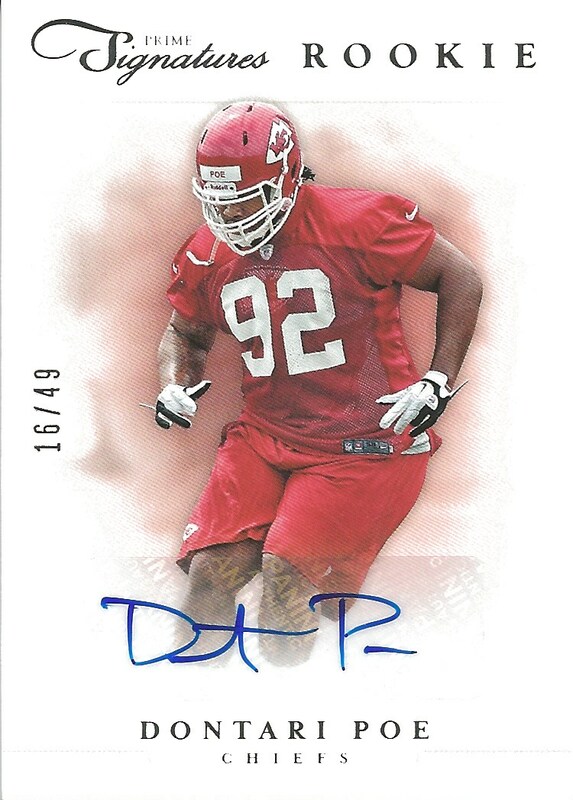 Now, if it was Dr. Dre, that would be a different story, sign me up for that auto. No big deal though, i’ll post it to ebay when i get the card back…if, i get the card back. As time slowly dragged on I began to wonder if i would ever get my Dre card in the mail. Dre Day never came. But there will always be this. A few months later, and by a few months later, i mean 10 of them, I stopped back in to Ricks’ shop. He asked me if I ever received my redemption card and I told him, ‘nope!’ He then informed me that i should give them a call and ask for my card, or better yet, ask for a Redskin. I thought he was crazy, you mean I can actually ask for my own redemption card! WONDERFUL!! Not wanting to talk to someone over the phone (if you knew me, this would make sense…) i sent them an email. A wonderfully worded email of course that very politely asked for a replacement card of Washington Redskin…an RGIII would be great. That was on April 8th of this year. This is when i got the ‘players schedule crap and being busy…’ blah blah blah. I get it. These guys are professional athletes and can’t be bothered half the time. The thing is, if you don’t have an autograph session with them locked up, don’t put them in your packs and boxes! Anyways, more time flies by and so i decide to give them a call. Scary. 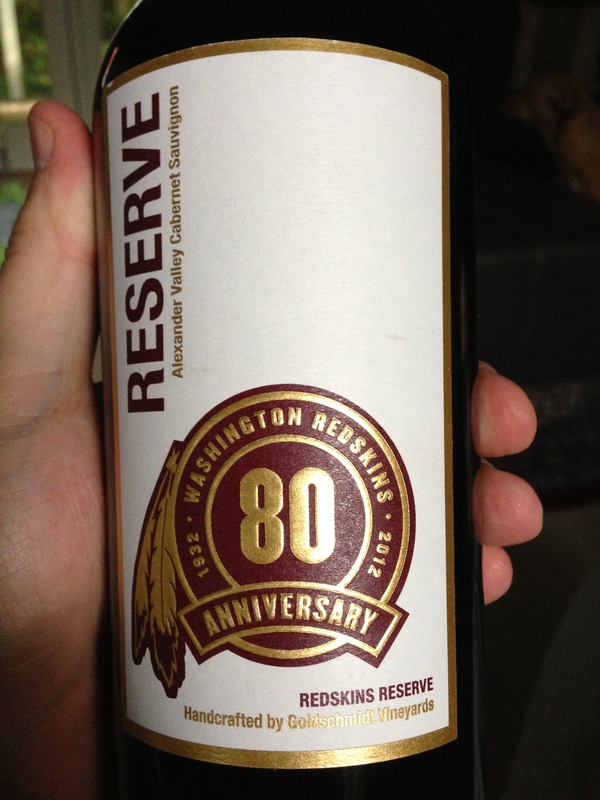 I very politely ask for a Redskin card and they oblige. I get an email that my Phillip Thomas Spectrum Autograph is on its way! I start tracking the card, excited to write a post about the card and whattayaknow? The card is sent to freakin Ohio. Ohio! Who the hell lives in Ohio…Westernville, Ohio? Who lives there? Seriously, who? Not me. This kid lives in Portland F****N Oregon. There is a shirt that says that. Ok, time for some more phone calls and emails over the Thanksgiving holiday. Most of you may not know this, but Phillip Thomas caught a lisfranc injury this preseason and was placed on injured reserve before the season started. The whole lisfranc injury is interesting to me. It sounds so harmless, like it was named after some sweet old lady that fell down the stairs to her root cellar and got a small fracture on foot. “OH NO, I LISFRANCED MYSELF! This got me wondering’ as i tend to do, my mind floats off into multiple tangents. So i wiki’d the Lisfranc injury and it sounds painful as hell. But wait, it gets better. Jacques Lisfranc de St. Martin was a pioneering gynecologist. I guess if you get a foot injury named after you and your daily task is to study vaginas, that’s pretty pioneering…or possibly just weird? He also removed rectums and amputated cervixes, so there’s that…jack of all trades i guess. 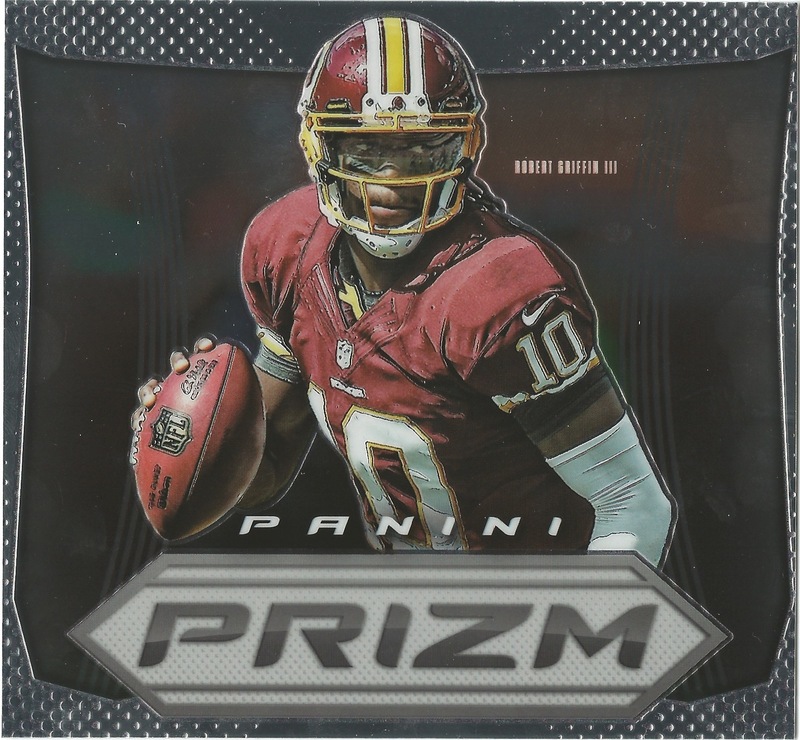 Prizm has had a huge impact on the hobby this year starting with the basketball version, to football and now to baseball. I picked up the football box a while ago and am just now getting around to reviewing it. Spoiler alert, i really liked what i saw. My favorite part of the box is that the cover image of RG3 was removable and created a nice box topper, top box-er of sorts. The cards for this set are awesome. 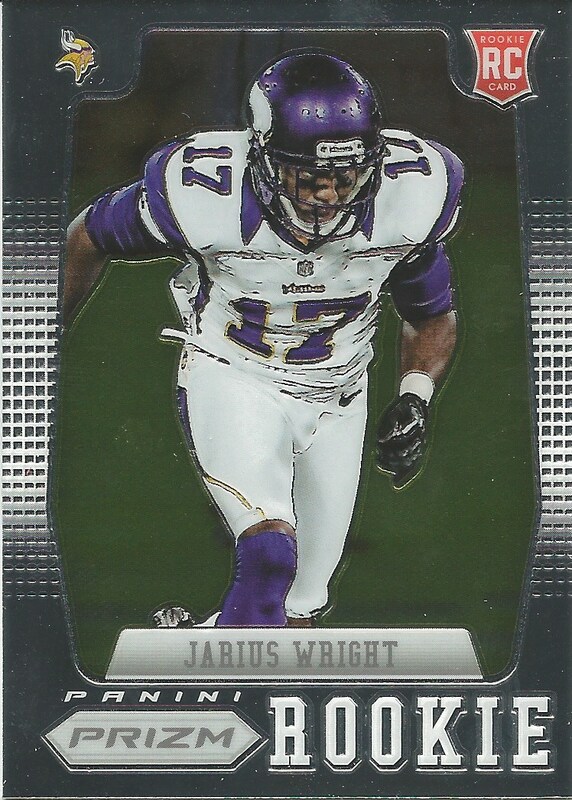 Panini did a great job of bringing in the shininess that we like and adding in some texture as well. 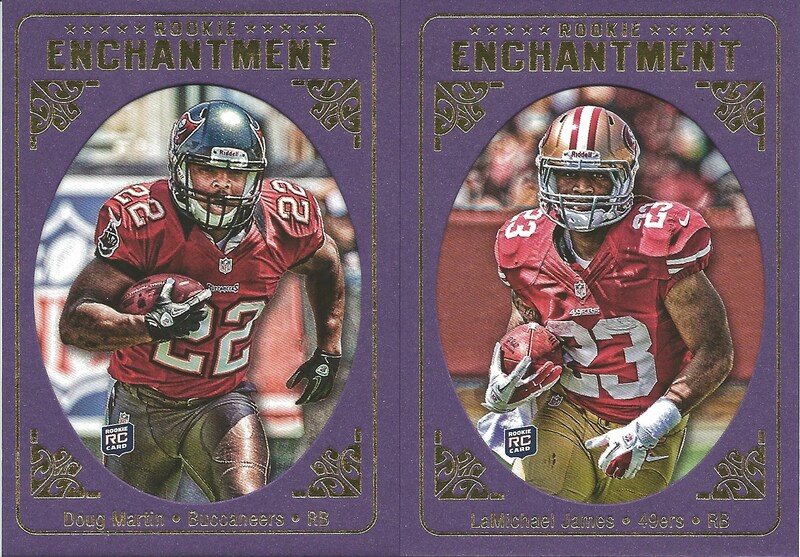 The cards have a feel of something from the future and the future is really cool…and shiny. Everything pops in the card and has a great thickness with the card stock used. 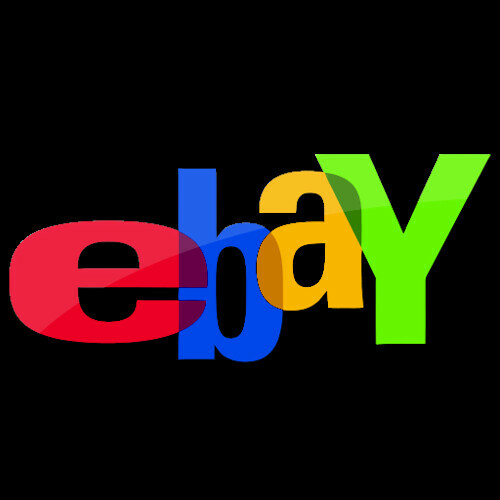 Each image appears to jump out of the card. The players blend in and out of the border of the card and each picture has a bit of a 3D affect to them. Again, there is minimal processing and a very high image quality. The best part for me is the slight recess that traces the border of the player putting the focus on their intensity and emotion. 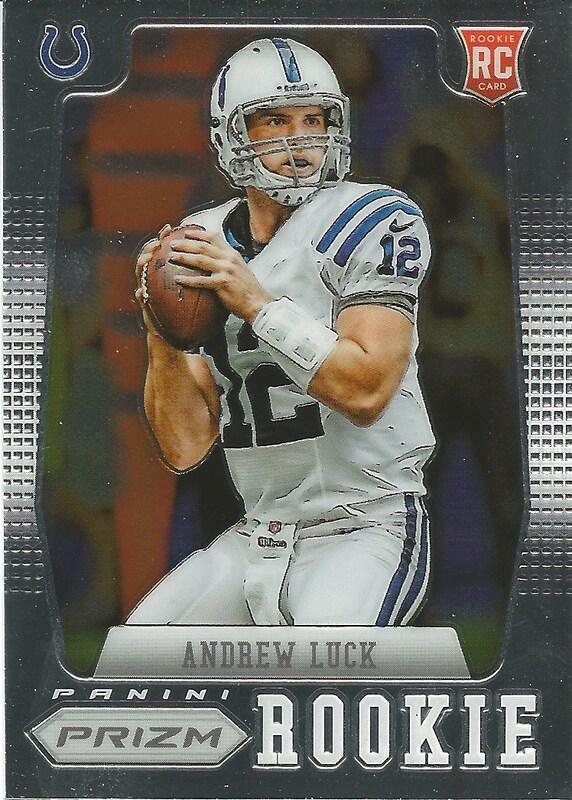 The hits for me were terrible, but hey, the base cards are great and I don’t think you buy this brand for the hits. You buy them for the quality of card along with the strong visual and textural quality of each card. 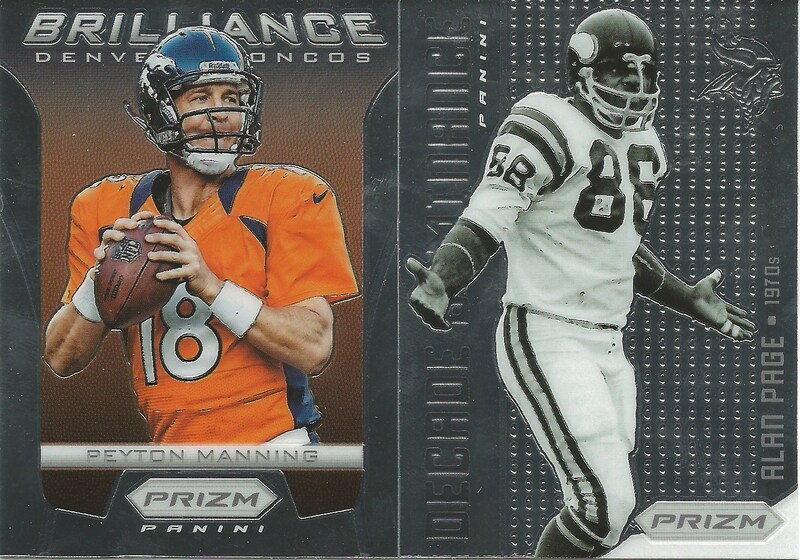 There were a couple of nice inserts in the box that offered a wide variety of players from Page to Peyton. 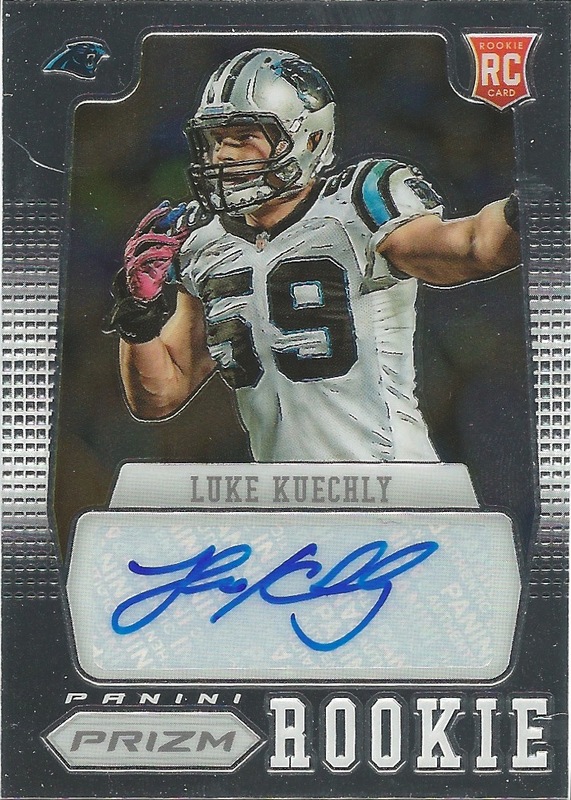 The Luke Kuechly auto is really cool and he seems to be one of the next great linebackers in the NFL. 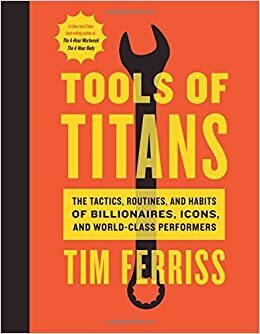 This is a great product and something i will be picking up next year. I’m not a fan of the baseball version since i can’t get over the lack of logos or photoshopped hats and jerseys. 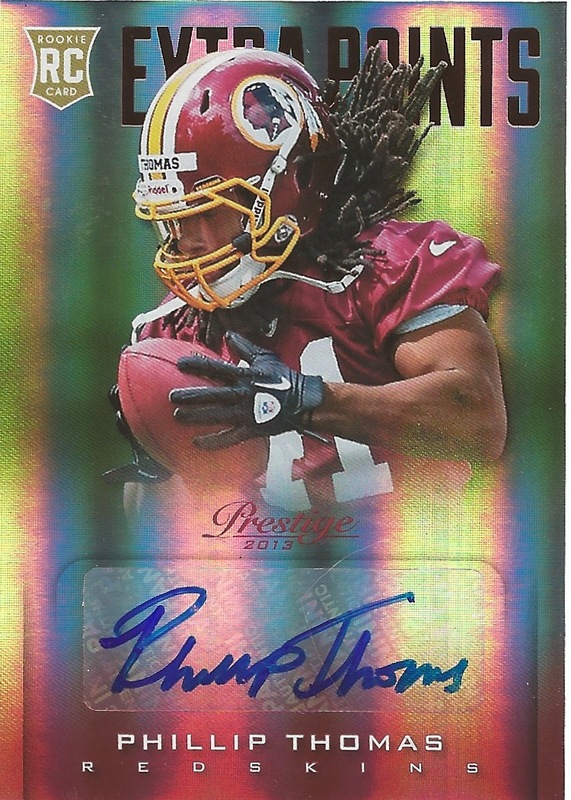 The quantity and quality of cards was great and i was able to get some of the base Redskins cards in my box. 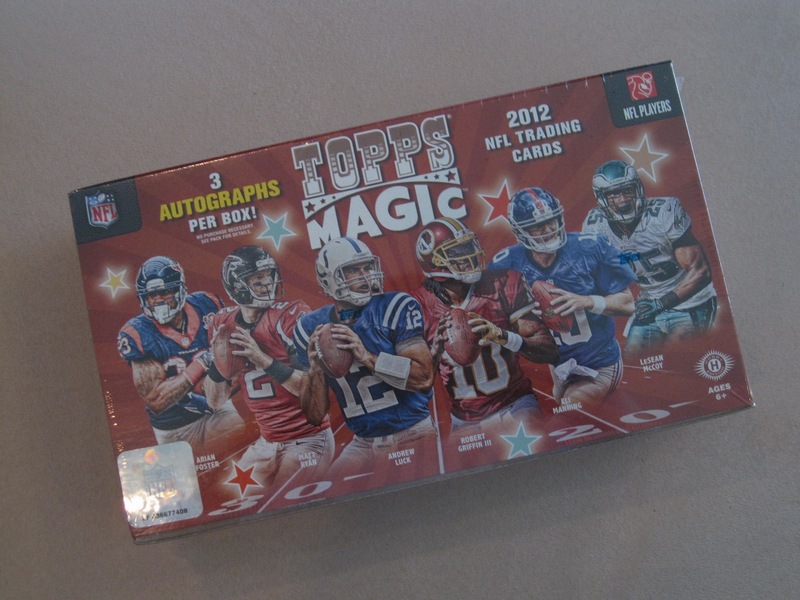 A busted box of Topps Magic Football has been sitting on my stack of cards for some time now just waiting to get judged, and now is the time. Magic was something that i got into (cards, not tricks) a couple of years ago on a whim at Target during a deodorant shopping event. I saw a blaster box just sitting there and thought it would be a cool purchase and was hooked from that point on. I loved the retro look and the college unis on simple borders. Loved it so much so that i ended up buy a few more boxes from Target but never completing the set or buying any hobby packs. The following year, 2010 i wanted to pick up a hobby box to see if i still had a crush on these pieces of cardboard and sure enough, the love was there. I loved the photography and simple borders as well as the card stock. Although i do love shiny cards, i am a sucker for matte finish stuff that is done well. 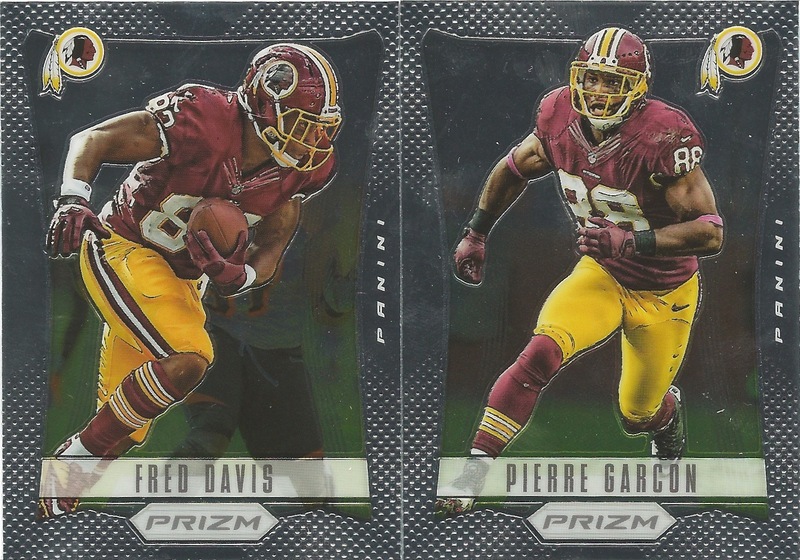 Again, i bought a bunch of cards, but couldn’t be bothered with completing the set…just wanted the few Redskins and any hits i could pull. Now, in 2011, it got a little tricky…and extremely annoying. Magic had become a set that i was tuned in to on when it would be dropping and where i could pick up some good packs. BUT, as Topps likes to do sometimes, they changed the rules, moved the goal posts and upset this collector. The only way to get a box of Magic was to purchase them from their online store and pay their exorbitant shipping fees, which was about the same price as the box itself if i remember correctly. SCREW THAT, no thanks. I was able to pick up a few singles from COMC and ebay but no packs, since they weren’t really issuing those this year. I never really found out why Topps decided this was a good idea, but would love to hear the reasoning if someone can help? After the previous years experience, i had pretty much forgotten about the Magic cards and moved on with my life as we do with Topps at times. Until, i saw they were going to be releasing a new set and boxes that you can purchase at a store…holy crap! You mean i can buy cards from a store and not online only? Normally i wouldn’t be so snotty about this, as i am totally cool with purchasing online, i just don’t want my only options to be online purchases. Takes away from the fun of busting packs on a Wednesday afternoon after work. 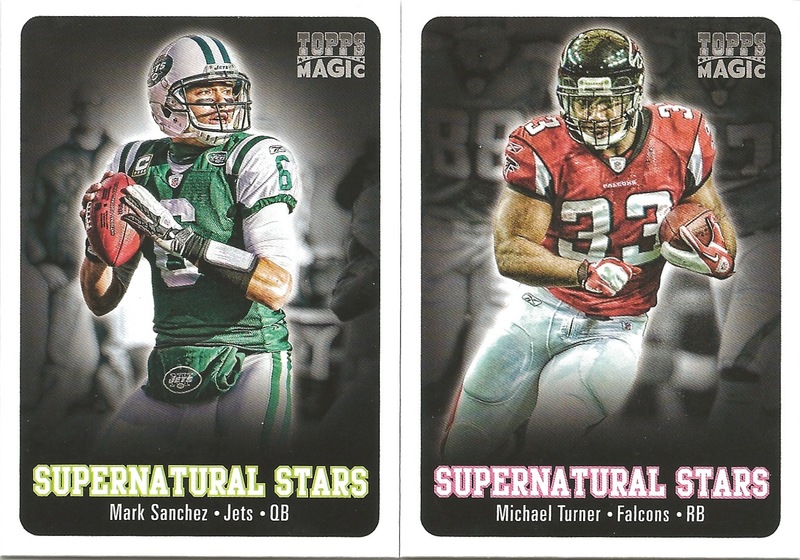 So here is my take on the 2012 version of Topps Magic. 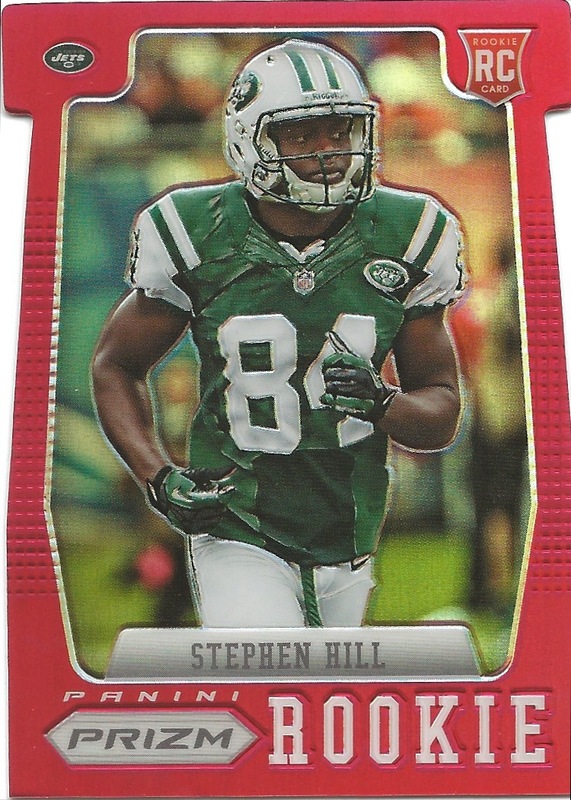 In keeping with the simple style, Topps has again followed through with the same KISS theme. Minimal information is on the front, but you get the basics; name, position, conference, team helmet, and a whole bunch of stars that make no sense to me. The banners blends in nicely with the border and unfolds to reveal the critical information like a scroll with an oversized shield. The backs are nice and include some fun little facts with the Magical Memoranda. You don’t get your typical stats, but they tend to highlight some important information and single game stats for your FYI. As usual, nice card stock and the lovely matte finish. 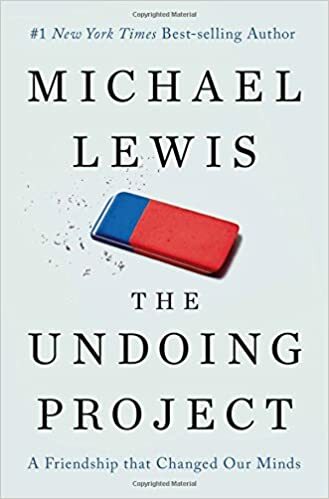 The matte finish is nice in a world of glossy cards. They have become the rarity in the hobby for the most part, save for the vintage inspired sets. The thing that i am most drawn to this set about is the photography. They have HDR’d the crap out of the photos and really over processed them, but i think it works well for these and tends to give the players a greater level of detail and grit. My wife is a photographer and she tends to stay away from over processing as it always looks…you guessed it, over processed. When you are doing family portraits or architectural photography it can become a distraction, but for professional athletes it works well. Look at the intensity in those eyes! The hits with this brand are minimal, which is fine with me. I believe collectors get too hot and heavy about the hits. If that is your thing, this set isn’t for you. If you are OK with getting a nice auto or two than you may be happy with Magic. I ended up pulling 2 autographs and a redemption card. 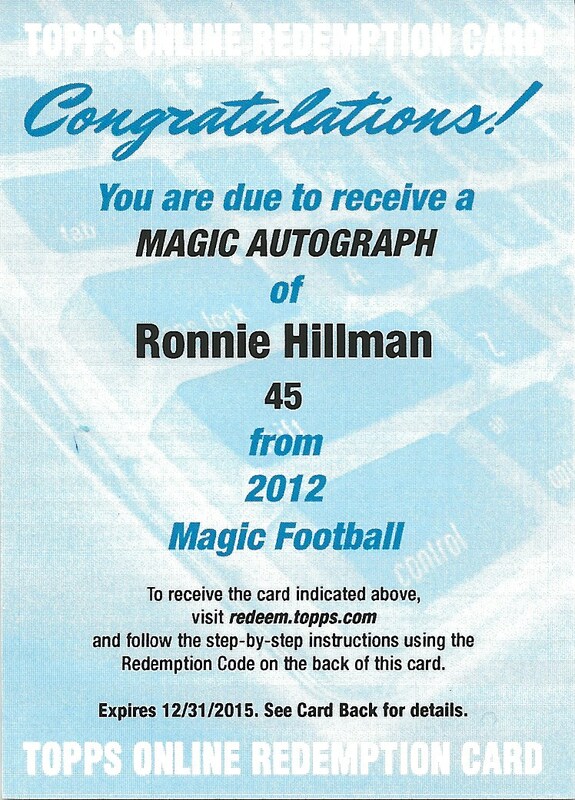 So, it’s not just Panini that is slapping me with redemption cards, Topps does it too. I’ve stated my thoughts on the redemption card here before and thought about it a little more. Still don’t like it, but maybe it’s not that bad…assuming you actually get the card. There have been times when i forgot about my redemption cards and come home to a manilla envelope. It’s like a little slice of cardboard heaven when you get one you weren’t really expecting. There are a couple of subsets in the cards as well. Nothing to exciting. 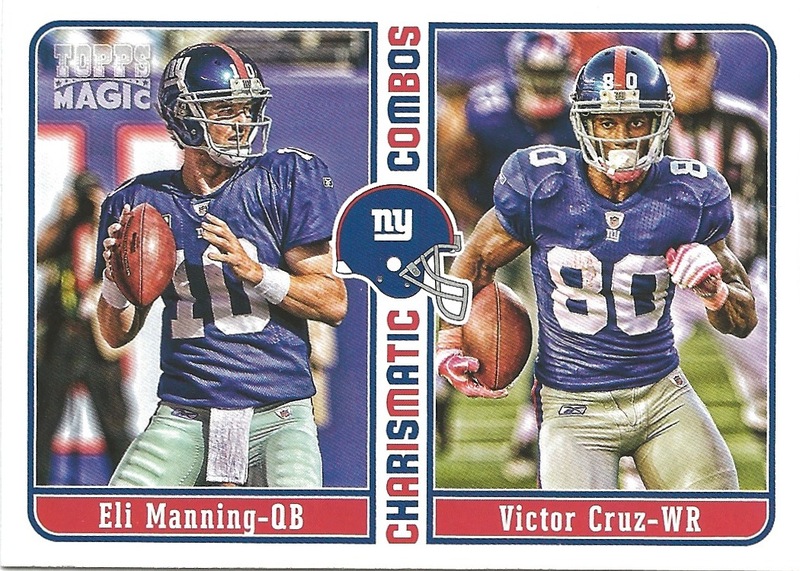 As a matter of fact, i must say that the Charismatic Combos is not only a weak insert, but a terrible name. Charismatic Combos, christ that’s terrible. The ultra mini cards are cool, but a little too mini for my man hands. If i don’t get these in some penny sleeves quick they will have rounded corners. There are also the Supernatural Stars, which are not that existential or starry either galactically or professionally. 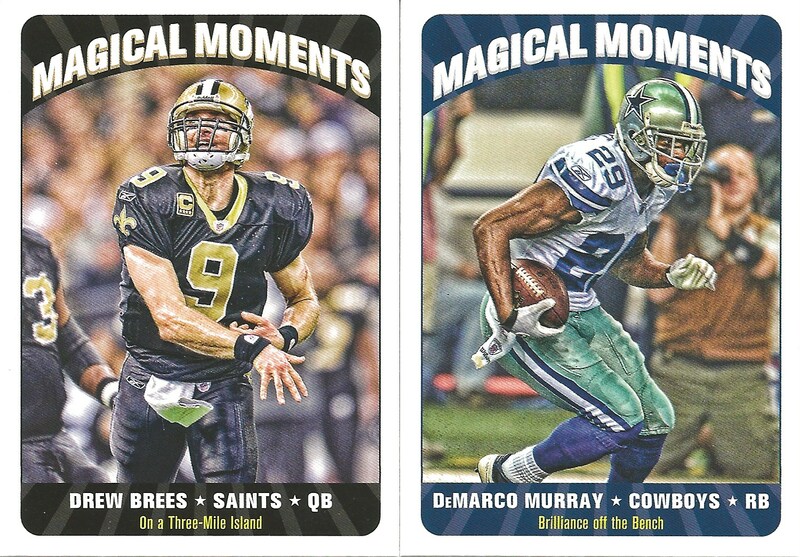 Magic also has the Magical Moments inserts which makes sense, because it’s Magic. Drew Brees is on a 3 Mile Island. Cute. 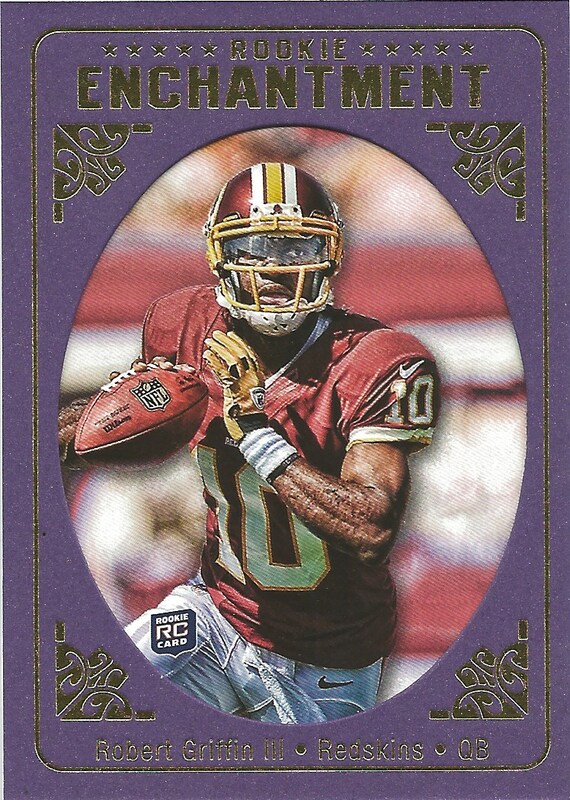 I do like the Enchantment cards, especially the one that i pulled…big smiley face for the RG3. There were also these other good looking young running backs that have some nice upside to their careers. 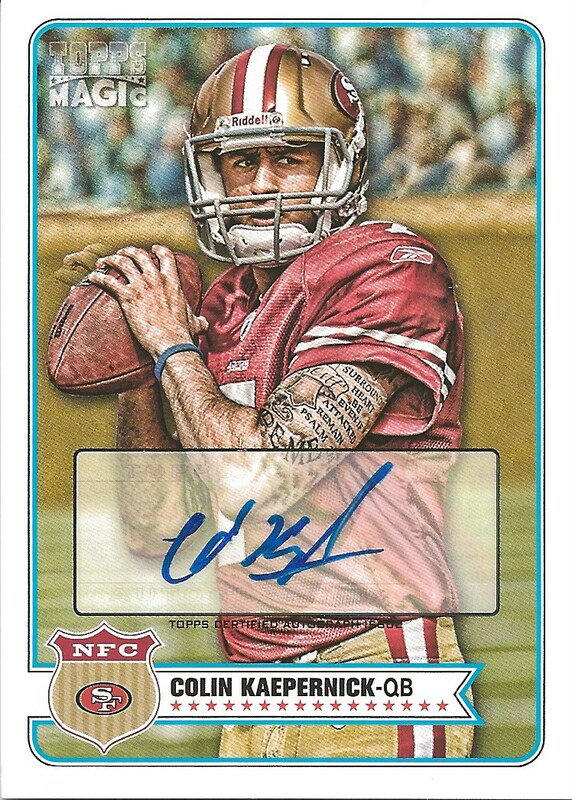 One of the autos i pulled was a Kaepernick. 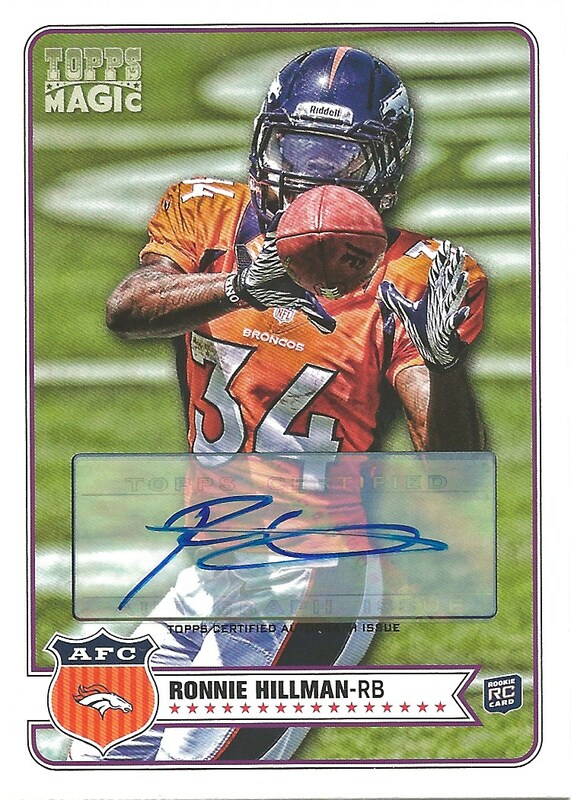 The HDR affect does his tats some serious justice although his auto is crazy sloppy. An odd thing about this card is the photoshop flub with his hands. 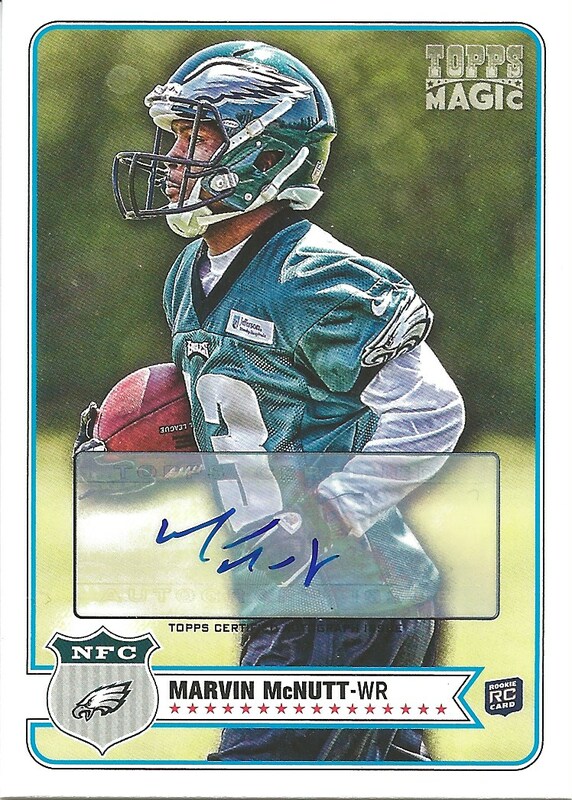 It looks like the photo editor cloned his left hand over the football…kind of a crappy job for a big time player. Let’s try harder next time Mr. Topps Photoshop editor. Overall, i do like these cards a lot. They are simple and clean and the photos are nice. It’s a basic card and the price point isn’t too excessive for what you get. I haven’t decided if i am going to build the set, i did manage to get quite a bit of unique cards and minimal doubles, so i will see how i feel about it. 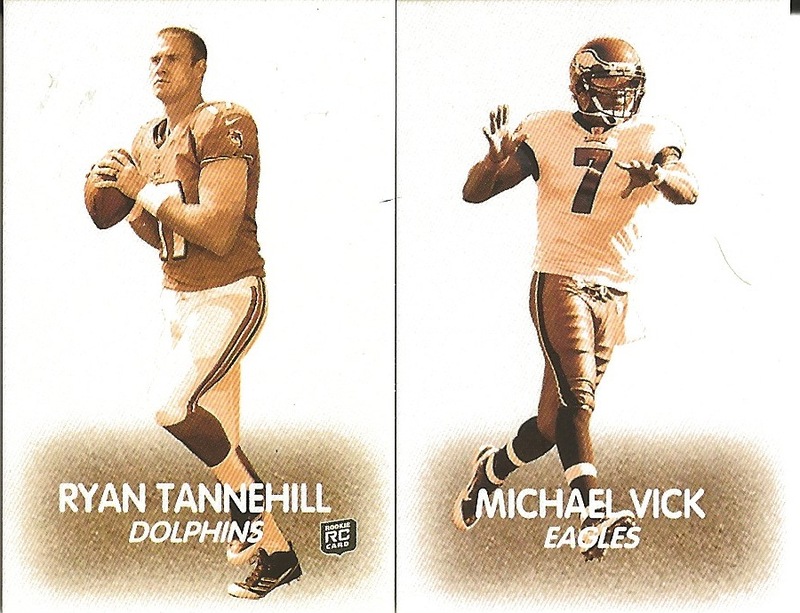 I do hope that Topps issues these cards again next year and does not do the online only thing. 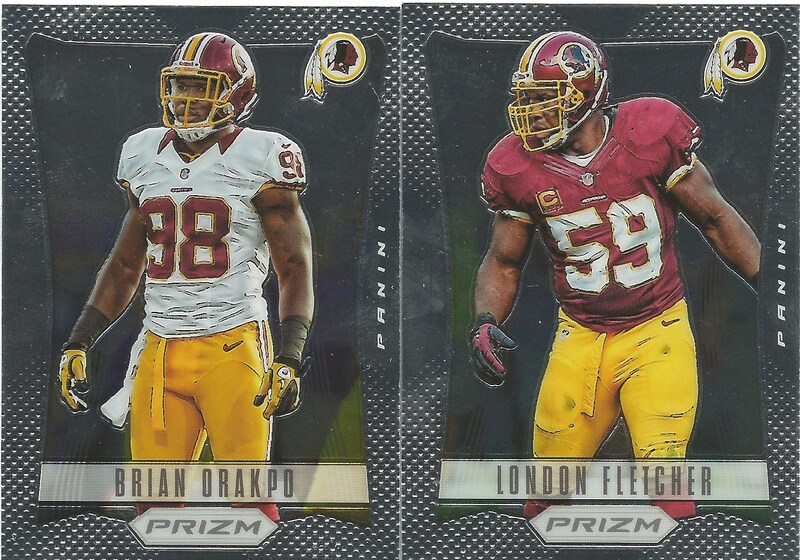 Here are a couple of the Redskins cards i pulled from the box. 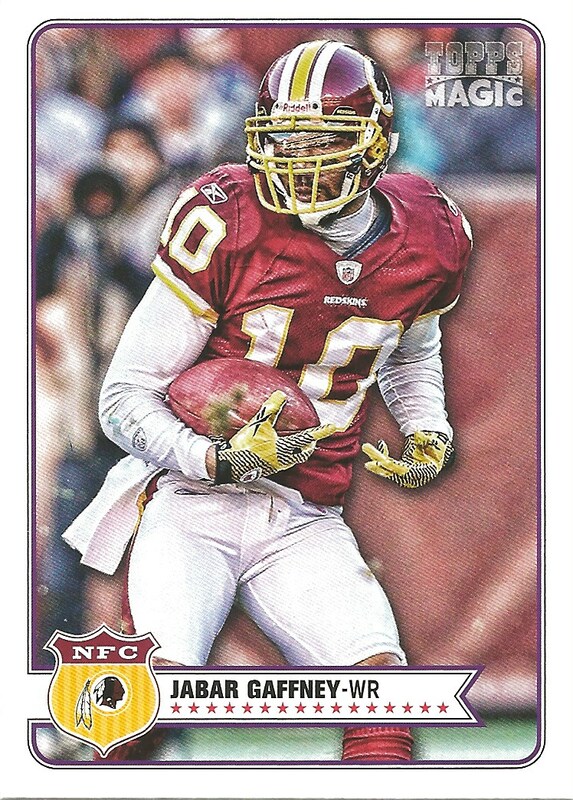 Funny that they decided to include Jabar Gaffney since he wasn’t on the team this year and he is wearing RG3’s number. 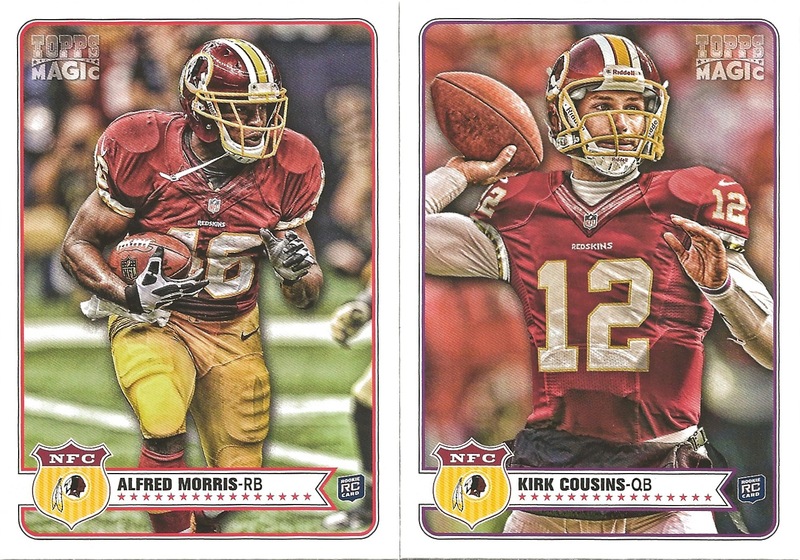 Technically, there are two Redskin cards with a player wearing number 10. 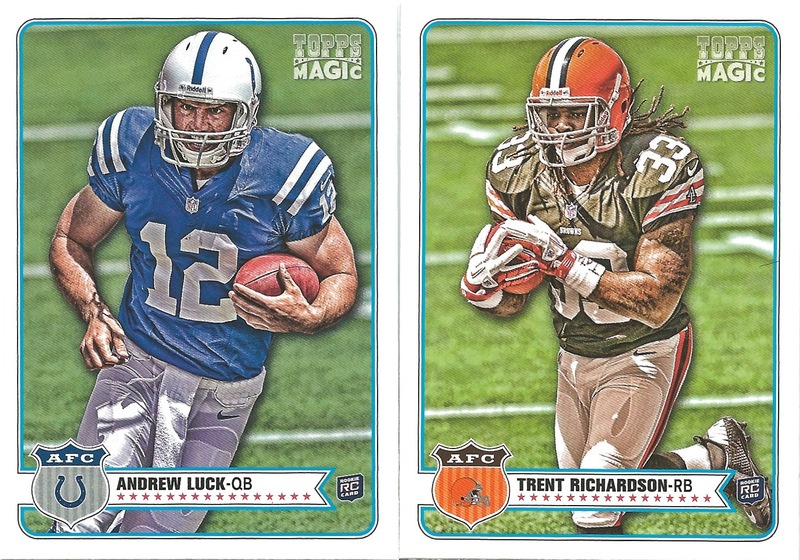 Topps Magic, I like you. Those immortal words were spoken by none other than the iconic Christopher Walken on the classic SNL skit…and now, I have a fever. I don’t need a cowbell, just some sleep and the ability to breathe through my nose again…such a simple task when healthy. I’ve become one of those neanderthal mouth breathers you find at your local gymnasium flexing in front of the mirror and twitpickin’…you know the type! 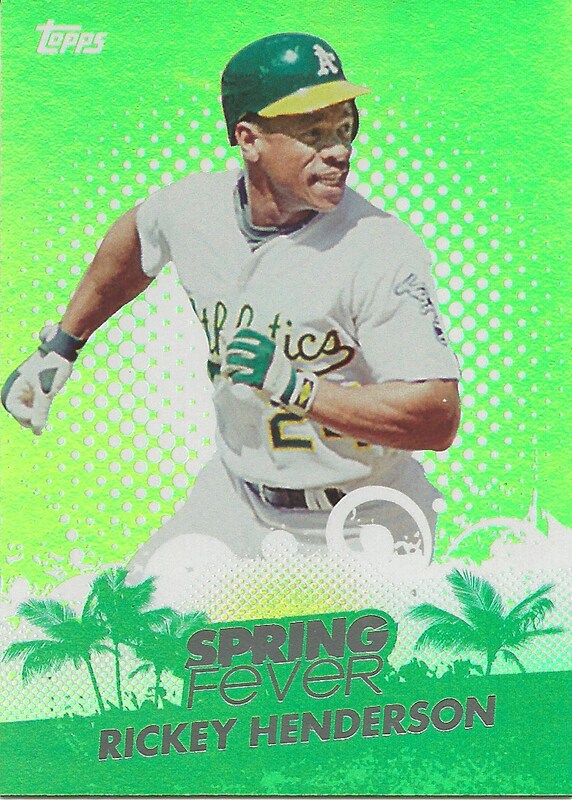 Another little bit of fever I caught today was some Spring Fever cards from the electronic bay of two of my favorite players. Both guys are players that i collect and play(ed) for the Yankees, one a legend and one well on his way. 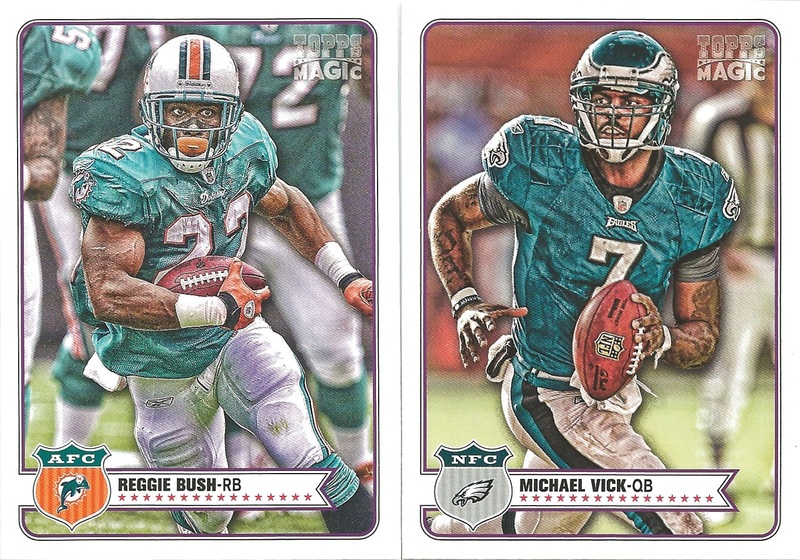 There are a couple more players that i’m chasing for my PC with this set, but these are great cards for starters. Unfortunately, these cards didn’t scan quite as nicely as they appear in person. 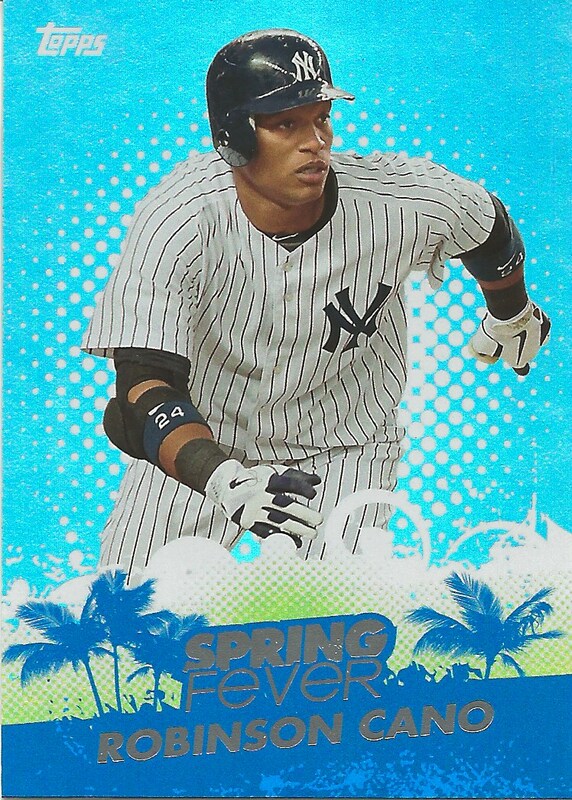 These are the first Spring Fever cards i’ve seen in person and am quite impressed with them. 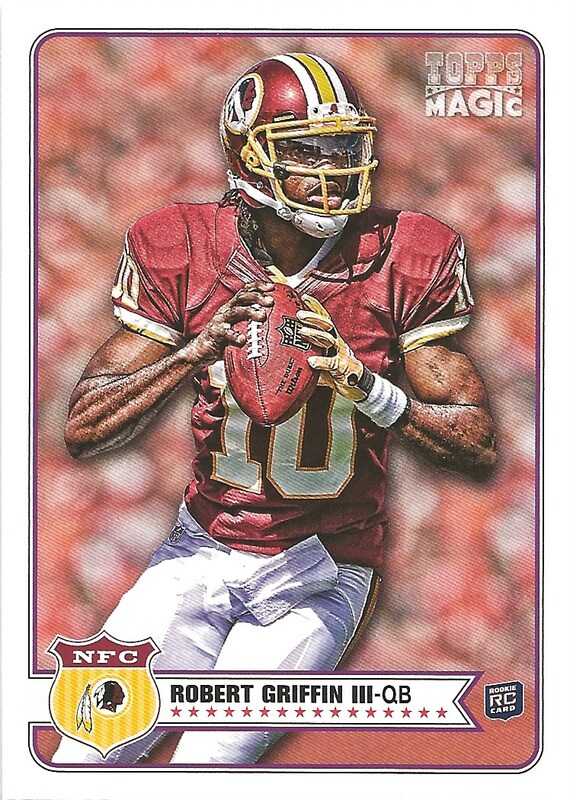 I love that Topps has been doing these inserts with their new flagship releases (football kickoff cards). It gets you in to the card shop and supporting your local shop. Unfortunately when i went to the shop last week, i forgot my one redemption card…and as i talked to Rick, he had actually run out of packs. Too slow on my part i guess. I should have a nice post or two this weekend with some COMC mail but that’s it for now!